See your peers' biggest priorities, most important KPIs, and marketing spending for mobile devices and experiences. 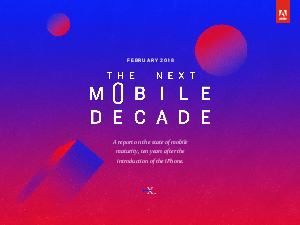 Between September and October 2017, Adobe surveyed close to 500 marketers and IT professionals to explore current mobile trends and priorities, get a glimpse of where they're going with their mobile efforts, and learn what the most advanced organizations are doing to create the next wave of transformative mobile experiences. Read our findings and see how mature your mobile strategies are in comparison to your peers'.